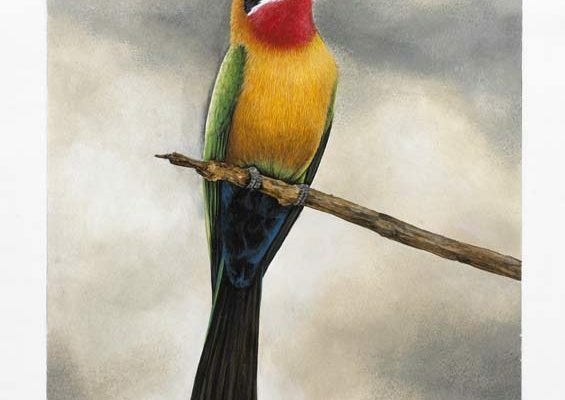 Robyn Abrey – Queensland Wildlife Artists Society Inc.
Born and reared in Rhodesia, Africa, Robyn was privileged to have a close association with all Creatures great and small, thanks to her Father being the head of the Veterinary Council and a leading Animal Conservationist. In 1984 the Abrey Family immigrated to Durban, South Africa, where Robyn helped her Father run his World renowned Bird Sanctuary – Umgeni River Bird Park. Although Robyn’s formal training as a designer allowed her to complete all the Bird Parks signage and illustrative work, her primary role was as the Head Curator of the large varied collection, involving the breeding, rearing and rehabilitation of many endangered bird species, and later the Free Flight Bird Show’s head trainer and presenter. Robyn was also commissioned to do extensive art work for a Bird Park at Iguacu Falls in Brazil, Foz Tropicana, which required her to travel there yearly for 6 weeks at a time, in order to complete huge illustrative murals and signage. She also ran her own Decorating and Paint Techniquing Company where she produced numerous murals for veterinary practices, school Science labs, businesses and private homes. Having immigrated to Australia in 2009, thanks to the offer of an Office Management position, Robyn is excited about the prospect of expanding her Artistic career to embrace more Australian flora and fauna, but is also paying homage to her African heritage with a series of graphite drawings of African animals and birds.